You are here: Home 2009 September Senate sides with Big Pharma against …. America ?? WASHINGTON ”” President Obama scored a big victory on Thursday as the Senate Finance Committee rejected a proposal to require pharmaceutical companies to give bigger discounts to Medicare on drugs dispensed to older Americans with low incomes. 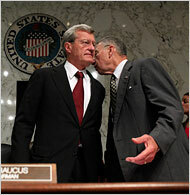 Senator Max Baucus, left, chairman of the Finance Committee, with Senator Charles E. Grassley, the panel’s top Republican. Senator Bill Nelson of Florida proposed discounts for drugs dispensed to some older Americans. Three Democratic senators ”” Max Baucus of Montana, Thomas R. Carper of Delaware and Robert Menendez of New Jersey ”” joined all the Republicans on the panel in defeating the amendment by a vote of 13 to 10. The committee plodded through the health care legislation for a third day, as lawmakers debated the proper role of government in securing insurance coverage for all Americans. With many amendments still to be offered, Senator Kent Conrad, Democrat of North Dakota, said it was highly unlikely that the panel could finish its work this week ”” the goal set by Mr. Baucus, the committee chairman. Under the June agreement with the White House, drug makers pledged $80 billion over 10 years to help “reform our troubled health care system.” In the belief that their contribution was capped, drug companies have run advertisements in support of a health care overhaul. Mr. Carper said the proposal to wring more rebate money out of the drug companies would “undermine our ability to pass comprehensive health care reform in this Congress,” because the drug industry would have opposed the legislation if it included mandatory rebates. In arguing against the proposal, Mr. Carper said, White House officials told him that “a deal is a deal,” and he agreed. Ken Johnson, senior vice president of the Pharmaceutical Research and Manufacturers of America, said the Nelson proposal could have caused job losses in the drug industry. “If our contribution to health care reform exceeds $80 billion, you reach a point where you risk sacrificing someone’s job for someone else’s health insurance,” Mr. Johnson said. Drug makers already pay rebates on drugs dispensed to many Medicaid recipients. Mr. Nelson’s proposal would have required them to pay similar rebates on drugs prescribed for another group: low-income older Americans eligible for both Medicaid and Medicare. The group includes people taking numerous prescriptions for multiple chronic illnesses, so they account for a large share of drug spending. Senator Charles E. Schumer, Democrat of New York, said he was “not at the table” when the White House and the pharmaceutical industry reached their deal, so he did not feel bound by it. Senator Charles E. Grassley of Iowa, the senior Republican on the Finance Committee, said that mandatory rebates were equivalent to price controls. In the House, Democrats on Thursday discussed how to meld health care bills approved by three committees. Speaker Nancy Pelosi affirmed her support for creating a government insurance plan to compete with private insurers. A public plan would increase competition, lower costs and “save enormous amounts of money” for families, businesses and taxpayers, Ms. Pelosi said. She scorned the idea of using the public plan as a backup to the private market, in case insurers did not meet certain goals for making affordable coverage available. The timetable for bringing a measure to the House floor is uncertain, although Democrats said they were making steady progress. They said they hoped to finish writing their bill next week and submit it to the Congressional Budget Office for review, so the full House could begin debate in mid-October. In the House, as in the Senate, Democrats are still trying to decide contentious questions like how to restrict the use of federal money for abortions and how to prevent illegal immigrants from gaining benefits under the legislation. “We’re narrowing the areas that we have to bring to resolution,” Ms. Pelosi said. DR. WEEKS’ COMMENT: Remember the truism that one works for the people who pay one. Thus it is with the Senate. This failure of the Senate to work for the people (in this case the elderly and instead to protectthe profits of Big Pharma) is a prime example of why we need campaign finance reform and why the seantors should be held accountable to serve those who elected them and not only those who gave huge donations. READ IT AND GET OUT YOUR ALUMINUM HAT..
Doctors working for the state – an extreme example of bad medicine. How grandkids perceive their grandparents!